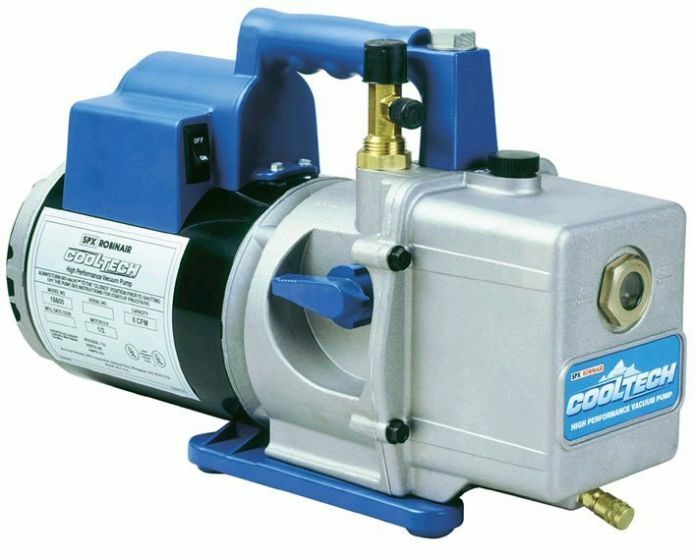 The Robinair Model 15600, 6 CFM is your best value as a low priced, high quality vacuum pump that's fast and thorough. It is the perfect studio pump to work with the ArtMolds vacuum chamber as it rapidly pulls a 29.5 +/- in/Hg vacuum within seconds. Its two stage design provides for greater efficiency—the second stage of the two-stage sign starts pumping at a lower pressure to pull a deeper ultimate vacuum. The inlet filter prevents contaminants from entering the pumping chamber; check valve prevents oil from backing up into system during a power outage. Heavy duty motor is easy to start and efficient to operate. The power switch is located on the handle assembly to protect it from accidentally being turned on or off. Sure grip handle stays cool to the touch and directs exhaust away from you. From our experience we have found that Robinair pumps perform better than other pumps in the industry, assuring you of fast vacuum every time especially needed in time sensitive materials. Robinair pumps are engineered specifically to meet the needs of the mold making artist, and to give you trouble-free operation. Oil Fill Port - Makes adding oil simple since the part is accessible from the front or either side. The sight glass on the front of the pump shows you when enough oil has been added. Two stage Design - Cleans the system more thoroughly than a single stage pump; the second state starts pumping at a lower pressure so you can pull a deeper ultimate vacuum. Die-Cast Aluminum Housing - Cast aluminum housings make the pumps lightweight and durable. Heavy Duty Motor - High torque design for easy startup and efficient operation. Molded Base - Durable polycarbonate base improves pump balance and minimizes vibration during operation. 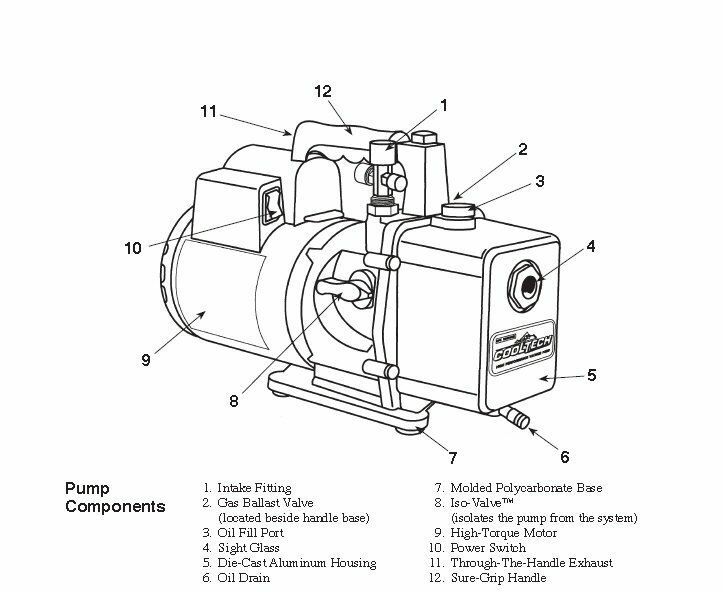 Iso-Valve- Isolates the pump from the system with just a quarter-turn. Offset Rotary Vanes - Our proven design builds a powerful compression within the pumping chamber to reduce system pressure and vaporize moisture so it can be exhausted along with air. Oil Drain Valve - Positioned at the bottom of the oil reservoir and angled for faster, more complete draining.